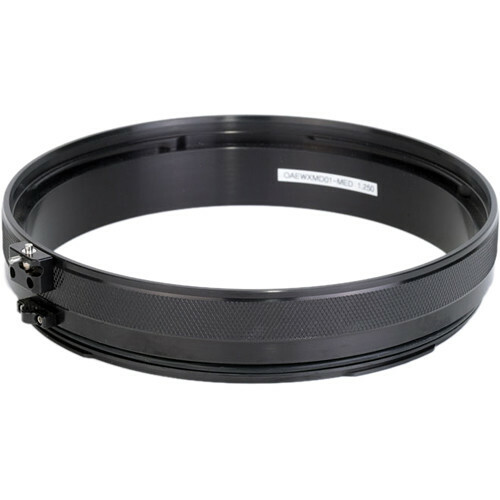 This medium 1.25" Lens Port Extension from Amphibico is designed for use on their Rouge Underwater Housing for RED Scarlet and Epic Cinema Cameras. It has a depth rating of 295'. It increases the length of the port to allow for the use of longer lenses. The extension mounts between the port body and the housing, and can be stacked on additional Amphibico extensions for an even greater length. The extensions connect to one another via bayonet mount, the same way the port itself connects to the housing. They are constructed from aluminum. For compatibility details, see Port Chart. Box Dimensions (LxWxH) 10.6 x 9.9 x 4.4"